Month: June 2014 - ThirtySevenWest ThirtySevenWest - Creative ideas about personalized custom ribbons, woven tags and labels, personalized gifts and more!!! The “Made Especially For You By” labels are likely the most popular ones ever created for home sewing, crafting, quilting, knitting and crocheting. Are you searching for that sewing label that you used to be able to get at the Mom and Pop shops, craft stores and fabric stores like JoAnne’s and Hancock’s and Michael’s that you sew in your garments? 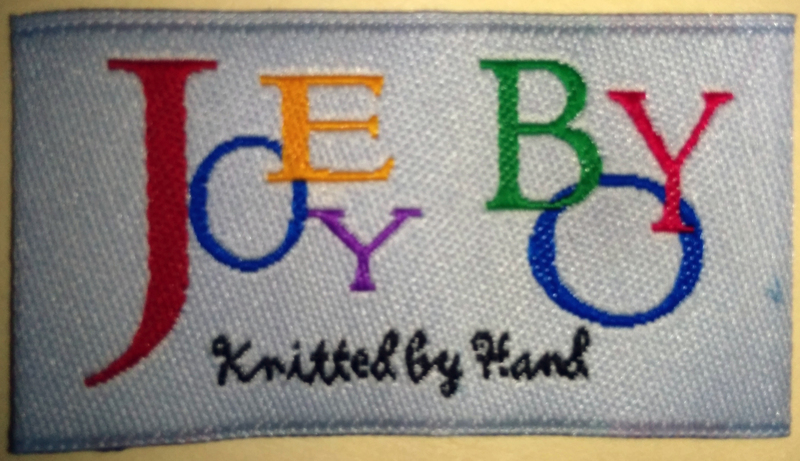 Or are you looking for custom woven labels, fabric labels, or woven tags for your creations? Well, here they are ! The message Made Especially for You By is woven into the label and your name or your company name is stamped on to them. Let us know if we can help you with this starting with smaller quantities and if you need labels for large quantities we can certainly assist you with quality custom woven labels with charm. Here are some testimonies on our website for this particular label to help you gain confidence in our quality and our customer service. Thank you for taking a moment with us. Feel free to send an email or pick up the phone and call us! Let us help you find the perfect label to brand your creation an heirloom if its for friends, family and loved ones. And a soft sentimental look if its for commercial use. Or in between for a prayer shawl ministry! This particular style of label has been very difficult to track down in fabric/craft stores, so I found it online. The delivery was very quick, the labels are perfect, teh customer service was excellent and I will definitely shop here again! These labels are so attractive, and professionally done, were delivered very promptly and helped to make this a very special Father’s Day. My daughter loved her personalized clothing labels that were tucked into her ‘surprise package’! The labels we ordered were of high quality and the price was great. Thanks for your quick and courteous service and updates. I am very pleased with the labels. The customer service I received was excellent. From the verification of my order to the delivery. The labels look great! I am very pleased and I will order again and again. Prompt service and quality product. Our labels are just what we ordered. The company gave us a few options and the ones we chose came quickly and are perfect, I would definitely recommend their service. I have no problem in stating that the labels received were of the quality that I was expecting. Every effort was made to get them to me before Christmas, even though I was ordering at the last moment. Should the occasion arise for me to use this company in the future…..I would have no hesitation in doing so….neither should you. My daughter and I are very pleased with the labels we ordered. We are using the labels for items we have hand made for Christmas gifts. The labels are attractive on the gifts and just what we needed. We needed a rush order and customer service came to our rescue! We will definitely use this company again. I was extremely pleased with the promptness of service on my labels. Since my name was a Cherokee name I appreciated the spelling being checked before the labels were made. Will definitely order again. How to Order a Custom Woven Label? Ordering custom woven labels for the first time? We make it as simple as possible for you! After all, you are busy, aren’t you! ? To order a custom woven label, we need specific information from you. Your label will be made according to what you envision and to your specification. Just tell us what it is that you need or want! Sometimes that feels a little bit daunting in the process. Especially if it’s your first time ordering labels. 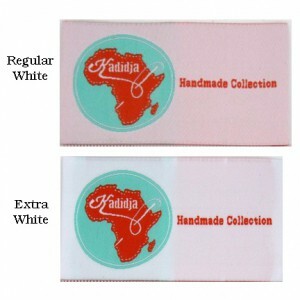 Let’s start with your label name for your custom cloth labels. That is the name that will be going onto your fabric label. It’s not necessarily your business name, but it is whatever the label will say. We then need to know what fabric weave you want the label made out of. For woven labels you can select from Damask, Satin, or Taffeta. We almost always recommend Damask as it is the most durable material. Damask labels will generally outlast the life of the product they are going on. And if your logo has a lot of detail, or a lot of small text, we can do a High Definition Damask, which uses a thinner thread to help make the design even more crisp and clean. Most labels will work well with the regular Damask, but the High Definition is also an option if needed. Satin is a great choice for bridal garments. It has a nice sheen to the background that gives the labels an elegant look. Satin does however have limited color options (see below about colors). Taffeta is good when you are looking for a more artistic look to your label. It is also the least expensive option if you are looking to spend a little less. With satin and taffeta labels you will be able to see little dots, called tie downs, where the thread is woven through the material. Damask does not have those, which is why is the most common and gives the labels the cleanest look. Some of the most important details we need are the size and shape of your label. We can do almost any size. The size and shape of your label is very important to the look you are going for and those are decisions that will need to be made by you. If you do not know the exact size you want your label, what I suggest is that you take your logo and print it out on a piece of paper in different sizes and cut it out and put it on the garment(s) that the labels will be going on. That gives you a good visual of the different sizes of the label and how they will look on your products. We had an instance where someone was getting labels for children’s wear and the labels they ordered ended up being too big for the garments. It wasn’t noticed that the size wouldn’t work before the labels came in. It wasn’t until they went to put the labels on the clothes that they realized they were too big. So they had to order more labels in a different size. So it is a really good idea to know the size that will work best and for you to have an idea of how the labels will look on your products before ordering. The sew allowance is also a really important piece of your label. To determine how much sew allowance you need to include in your labels it is best to ask the person who will be sewing the labels into the products how much space they need. Some people are very precise sewers and need very little space and others want more sewing space to work with. Generally 1/8″ is as small as you would want to go with a sew allowance. For couture, I’ve made 1/16″ before, it was highly unusual, and it was only the one time. I would say 1/4″ – 3/8″ would be an average amount of space if the sewer is not super precise. And 1/2″ sew space would be good for something that’s bigger, more durable with a deeper scene, or if is being sewn into a seam so there is more space to make sure the label is sewn in securely. With the sew allowance, we also need to know which side(s) of label you will be stitching to the garment. You can sew on the ends, either the left and right or top and bottom (depending on the size and shape of your label), this is common when the label will be going flat onto the product where the ends will be exposed, or when just the ends will be tucked into a seam. Also common with a label going flat on the garment is sewing on all 4 sides. We recommend sewing the labels on all 4 sides for baby and childrens products, to ensure they are securely adhered so not to cause any harm to the child. Sewing a label down on all 4 sides is also good when the label will be going on the outside of a product, like on a blanket or the outside of a bag or purse. 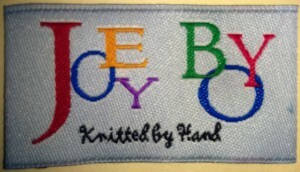 You can also sew labels in on the left or right, or the top or bottom. Side sewing and top/bottom sewing, is most common on center folded labels, when they are being tucked into a seam, or going around the edge or hem of a product. The next piece of information we need are the colors of your label. We need to know what color background you want and also what color(s) the artwork and text will be. There are several different types of color codes. What we need are Pantone Process colors. Their code is PMS####. Then the thread is matched to those colors to weave your labels. Most of the time, if an artist did your logo they will have the Pantone Process colors for you. If not, you can go to your local print shop, like a Kinko’s, and ask to see their Pantone Process book or chart. This will show you all the different available colors you can pick from. We don’t suggest picking out your colors online because every monitor shows colors differently and what you see on the screen is almost always different than how the color will look in person, unless you have invested in a color calibrated monitor. So to get a true feel of the colors you want on your label, we suggest taking the time to go to a print shop to pick the colors in person to ensure they are what you really want. When weaving labels, the artwork color that you see on the front of the label will actually be behind the background color on the back of the label. So if you select a light background color and a dark artwork color(s) then that will darken or alter the background color some. When white is the background color, we often recommend doing an extra white background (only available in damask material), which will help keep the background brighter white by preventing the other colors from showing through as much – pictured to the left. We can do this with other colors as well in the damask. However, sometimes the slight patina that is created from a regular background is also very pretty. It just depends on the look you are going for with your labels. With satin labels, the background colors are limited to mostly black, white, and grey. We can sometimes do other colors in satin but it is difficult to match Pantone colors. We can also do a reverse satin, if you are interested in that to broaden the background color options a little. We will also need to know what kind of fold you want for your labels. You can do an end fold, a center fold, or a flat fuse cut label. With end folded labels the ends are folded under, either the left and right or the top and bottom (depending on the size and shape of your labels). 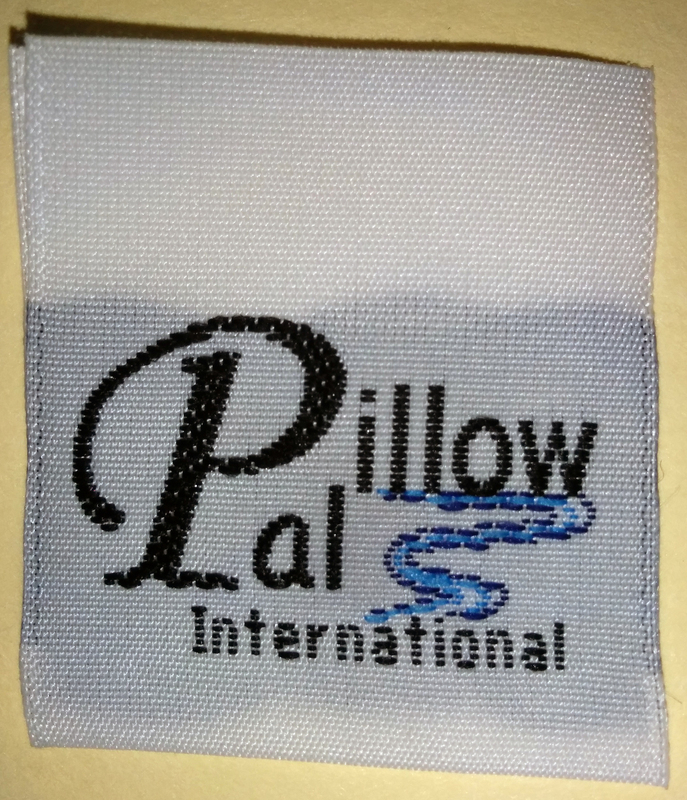 This is most common for labels that are being sewn on the ends. You can however do an end fold and still sew on all 4 sides. If you do an end fold label, please note you DO NOT include the folds in the size of your label, that is added on and folded under on our end, we just need you to tell us what size you want the face of the label to be. Center folded labels, also called loop folds, can be folded on the left, right, top, or bottom based on your needs. If the fold is on the left, then they are sewn on on the right, if the fold is on the bottom, then they are sewn in on the top, etc. And flat fuse cut labels have no folds and are heat sealed on all 4 sides to prevent fraying. And the final thing we need to get you an accurate quote is your artwork. We ask that the artwork be sent in the correct size, just as it is to appear on the labels. We need it in a .jpg that is at least 350 resolution. We can use draft quality (less than the 350 resolution) for a quote, but to proceed past that we will need the full resolution artwork. Also, the smallest text we can weave is an 8 point font, for most fonts. So please be sure your text is at least an 8 pt, or larger even if the font has a lot of detail. This is to ensure it weaves nicely and everything is legible. The most important thing is to design a label that is going to represent your branding, your style, the look that you want. It’s all in the sizzle, not the steak, right? So what someone remembers is your logo, or your text, whatever that you put on the label. I call it your business card where your product goes. If someone sees that shirt or that baby product and they just love it, they are going to look at the label in your product to find out where it came from and that is the best way for them to get back to you and for you to get more business.